Explanation: What's happening on the horizon? 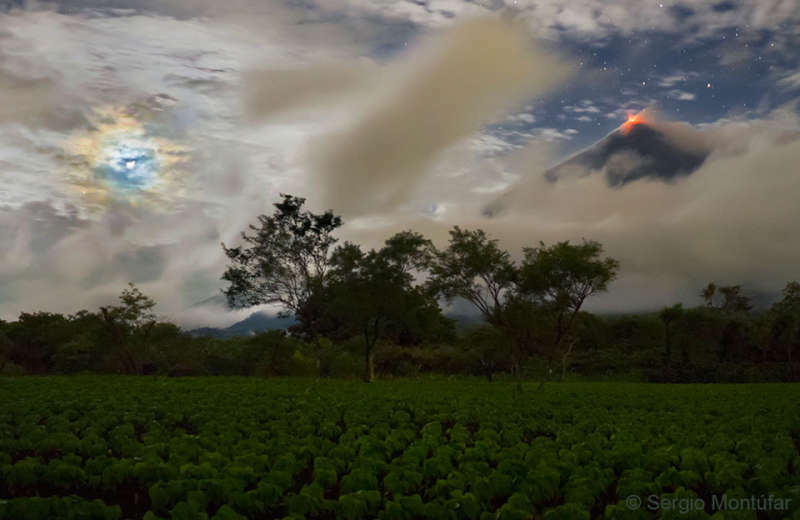 The horizon itself, past a spinach field in Guatemala, shows not only trees but a large volcano: the VolcАn de Fuego (Volcano of Fire). The red glow at the top of the volcano is hot lava. But your eye may also be drawn to the blue circle above the horizon on the left. This circle surrounds the Moon and, together with other colors, is called a corona. A corona is caused by diffraction of light -- here moonlight -- by small water droplets in the Earth's intervening atmosphere. A break in the clouds on the right shows stars and even the planet Saturn far beyond the volcano. Although VolcАn de Fuego frequently undergoes low-level activity, the astrophotographer considered himself lucky to capture the scene just during an explosive eruption in late September.